For other spirits whose name translates as "water of life", see Aquavitae and Akvavit. Three bottles of eau de vie. The flavours are framboise (raspberry), zinfandel grape, and cherry. An eau de vie[A] (French for spirits, literally "water of life") is a clear, colourless fruit brandy that is produced by means of fermentation and double distillation. The fruit flavour is typically very light. In English-speaking countries, eau de vie refers to a distilled beverage made from fruit other than grapes. Similar terms may be local translations or may specify the fruit used to produce it. 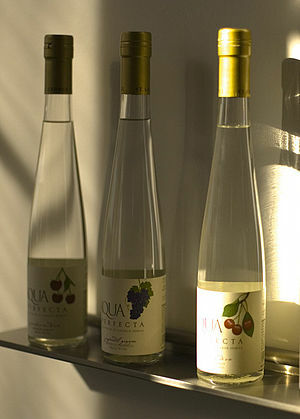 Although eau de vie is a French term, similar beverages are produced in other countries (e.g., German Schnaps, Balkan rakia, Turkish rakı, Romanian țuică, Czech and Slovak pálenka, Hungarian pálinka, and Sri Lankan coconut arrack). In French, however, eau de vie is a generic term for distilled spirits. The proper French term for fruit brandy is eau-de-vie de fruit, while eau-de-vie de vin means wine spirit (brandy), and several further categories of spirits (distilled from grape pomace, lees of wine, beer, cereals, etc.) are also legally defined as eau-de-vie in a similar fashion. Many eaux de vie made from fruits, wine, pomace, or rye have a protected designation of origin within the European Union. Most commonly available flavors in France are eau de vie de poire (pear)—known as eau de vie de Poire Williams when made from the Williams pear—Eau de vie de framboise (raspberries), eau de vie de pomme (apple), eau de vie de mirabelle (yellow plum), and eau de vie de pêche (peach). When made from pomace, it is called pomace brandy or marc. In the Caribbean, eaux-de-vie are made from tropical fruits such as banana, ambarella, guava, mango, pineapple, and sapodilla. An eau de vie is usually served as a digestif. The typical serving size is 30 to 60 ml (1.1 to 2.1 imp fl oz; 1.0 to 2.0 US fl oz), owing to the high alcohol content of the spirit and because it is typically drunk after a meal during which wine, or some other alcoholic beverage, has already been served. ^ Asimov, Eric (2007-08-15). "An Orchard in a Bottle, at 80 Proof". The New York Times. Retrieved 2007-07-21. But his first love are the gorgeous, impeccably pure eaux de vie that he makes from pears and plums, cherries and raspberries, and even, in a distinctly Northwestern touch, from the springtime buds of Douglas firs. Look up eau de vie in Wiktionary, the free dictionary. Wikimedia Commons has media related to eau de vie.